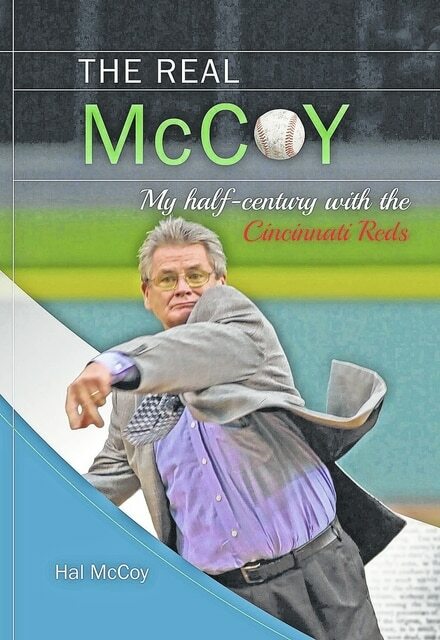 The cover of longtime sportswriter Hal McCoy’s book “The Real McCoy” is shown. McCoy has covered major league baseball and the Cincinnati Reds for 43 years. He has won 48 state and national writing awards and has been named Ohio sportswriter of the year 13 times by the National Sportscasters and Sportswriters Association. McCoy was elected to the Baseball Hall of Fame in Cooperstown, N.Y. in 2002 and is the only non-Cincinnati resident who is a member of the Cincinnati Journalists Hall of Fame. “The Real McCoy” provides an inside-the-dugout look at events that never appeared in the daily press. McCoy details the dismantling of The Big Red Machine, what really happened to Sparky Anderfson, and where Pete Harnisch hid his toothbrush. The program will start at 6 p.m.